Grundig, Europe’s sole full range manufacturer of home electronics, continues to redefine kitchen design, with its latest range combining cutting edge kitchen technology and breath-taking design. The Gourmet Chef™ elegant and sophisticated design goes hand-in-hand with advanced cooking technology, including 7” Touch TFT Display that allows users to control the in-oven smart functions, for easy monitoring and adjustments to the cooking process. Users can take advantage of the full range of the Gourmet Chef™ Oven’s features, through recipe ideas and 75 automatic programmes tailored to specific dishes, all developed by professional chefs. Grundig’s FlexiSmart™ Induction Hob has the power to take over cooking using sensor technology. Fitted with the latest sensor technology and housed within a ceramic glass exterior, the 80cm FlexiSmart Induction Hob is designed to help users recreate restaurant worthy dishes at home. Users can browse an autocook menu on the intuitive-to-use touchscreen TFT providing easy access to a range of recipes and step-by-step guides. With the ability to recognise the exact temperature and adjust to help users see better cooking results and preventing accidents such as spilling over or burning food. Known as the world’s first sous-vide cooking induction hob, users are left to focus on the joy of cooking while the FlexiSmart™ Induction Hob takes care of the details. Virtual User Experience Technology (VUX) Hub is set to completely revolutionise kitchens. Relaunched last year with the latest in cutting edge technology, the system transforms an ordinary countertop into an interactive and stylish control making it a must for any modern home. Using a projector, displayed onto the kitchen counter by a projector in the hood, the highly sophisticated control panel blends seamlessly into the worktop, removing any physical knobs and buttons to provide a more hygienic and easy to clean surface, as well as appealing to the style conscious. 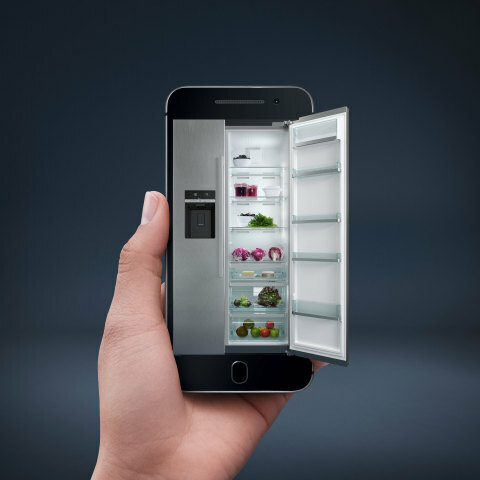 Freshness has a new home, with Grundig’s Professional Design Built-In Refrigerators. Featuring a stainless-steel interior, Grundig’s professional refrigerator range takes the concept of symphony and harmony and combines it with the flawless elegance that Grundig is known for. Fitted with CustomFresh+ technology, Grundig’s Professional Design Refrigerator has special compartments with an adjustable temperature range that enables food to remain fresh for three times longer than standard refrigerators. Users who enjoy entertaining will also benefit from the refrigerators’ large capacity and built-in wine cooler. Grundig’s Professional Design Refrigerator complements the brand’s new built-in refrigerator range, designed to complement the kitchen aesthetic. Elegant in design, Grundig’s premium hood range features the unique Induction Air System, a space saving innovation combining an induction hob and a hood together, in a single appliance. Allowing kitchen designers not to be confined to the traditional hood over hob model, this innovation provides users with a cleaner, modern aesthetic for their kitchen. Grundig’s built-in hood range boosts an impressive A+ energy rating and helps to control energy consumption in the home by offering outstanding ventilation solutions. Eliminating food odour the ranges use a touch sensitive control LED display, with a unique feature that minimises noise, awarding the product with an A sound quality certificate. Grundig’s latest dishwashing technology, the innovative Corner Wash™ system, ensures that every surface of the dishwasher’s contents is cleaned until spotless. Powered by a three-spray arm and specially designed nozzles, the Corner Wash™ system ensures that, corners are never missed and all food is thoroughly cleaned off each dish perfectly, even stubborn stains. Grundig’s latest dishwashing range also features the unique odour removal dishwasher. Fitted with Grundig’s IonFresh technology, bad odours are removed without harmful gases or chemicals, enabling users to have a healthy, happy home. Taking strength from its innovation capabilities, Grundig is committed to leaving behind a smart and sustainable future for next generations. Grundig has partnership with Amazon in order to provide consumers with the household goods they need, when they need them. Partnership includes participation in Amazon’s Dash Replacement Service (DRS), which means that Grundig’s connected dishwashers are now able to automatically reorder detergent and rinse aid supplies as consumers need. Users will be able to control their Grundig HomeWhiz appliances through Amazon Alexa, turning these appliances on and off, pre-heating the oven and monitoring the progress of washing simply by asking. Grundig’s HomeWhiz® app allows users to control the Grundig products from a tablet, phone or Smart TV, meaning that users can monitor and manage their appliances no matter where they are. HomeWhiz® allows users to remotely change and monitor things such as their washing programmes or hood ranges settings, as well as receiving alerts. Users can also develop customised settings, creating a digital ecosystem that fits around lifestyles and through Program Download can download many programs in line with their needs. For more information, please visit the Grundig press centre here. Grundig is part of Arçelik A.Ş, the leading home appliances manufacturer of Koç Group, a Fortune Global 500 company. Being on the market for over 70 years, Grundig enjoys over 90% brand awareness in the German market with its high-quality products and a customer-focused approach. Upon entering the German white goods market in 2013, Grundig has become one of Europe’s sole full-range manufacturer of home electronics. The brand remains true to its brand attributes including its German heritage, user-friendly and elegant design, eco-consciousness, high standards and quality control. With a portfolio of more than 500 different products – ranging from OLED TVs, mobile audio devices, hair styling devices, vacuum cleaners and kitchen appliances to ovens, dishwashers and washing machines – the brand offers a solution for every room in the modern home. Accolades received by Grundig include the Product Design, Red Dot Design and Plus X Awards. The brand has won critical acclaim from Stiftung Warentest, a leading global testing institute in Germany and the Trusted Reviews, an independent UK testing organization. Grundig products are mainly produced in own production sites in Europe and marketed in more than 65 countries around the world.